You can accomplish more as a group through teamwork. – Rabbit loves to lead, and to plan, but he often overlooks something important. Luckily, Rabbit has friends for support, who will lovingly point out those things he might have missed. Love means looking past one another’s faults. – Although he’s very controlling at times, and resistant to newcomers or unexpected change, Rabbit is still able to adapt and develop good friendships. His friends look past his shortcomings too, and love him in return. Organizational skills are a very valuable talent. – Every team needs at least one member who is willing to handle the planning and preparation. It takes everyone to get it all right, but any team needs Rabbit’s kind of leadership to get and keep things moving. Having helpful friends and mentors is a blessing. – Rabbit knows that he can look to Owl for sage advice when he needs it. He is wise enough at times to know when he needs an additional source of wisdom. When he tries to plan things out by himself, he doesn’t get very far. We need to make sure we keep some room in our lives for friends. Rabbit gets so worried about someone upsetting his garden or the order in his life that he pushes others away. Having a neat and orderly garden isn’t nearly as important, or as enjoyable, as having friends to share it with. Cleverness for its own sake leads to mistakes. – Rabbit’s plans are almost almost always more complicated than they need to be in order to accomplish the task at hand. In fact, he tends to overlook very simple things in the process. A balanced diet with vegetables can keep you healthy, and not stuck in doorways. – Rabbit loves his vegetables, and always has great food to eat. When Pooh comes by to eat honey, he gets too fat to leave! If only he’d eat Rabbit’s vegetables instead. We can get along with others despite our differences. 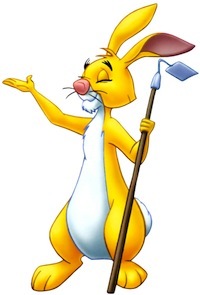 – Rabbit doesn’t like Tigger because he bounces so much, and often wrecks his garden. Still, he accepts him as a member of the community, knowing that he’s a rather jumpy character himself. It’s good to have brains, and it’s good to have fluff; but it’s better to have both. Rabbit likes to think that he and Owl are superior to the others because, in his words, they “have brains; the others have fluff”, meaning that they are just the stuffed animals of Christopher Robin, nothing more. Rabbit learns that brains aren’t everything and you need a little fluff too, to be a real friend.